Jennifer Park's parents ran a bowling alley in Nanaimo. Now she competes for Canada on the world stage, including at the Pan American Games. Chad Hipolito photographs for the Globe and Mail. Jennifer Park recently returned from Mexico with a souvenir made of silver. The 37-year-old mother of three, who is on maternity leave from her job as an office manager for a chartered accountant, spent a few days in sunny Guadalajara, a city known for its colonial architecture and its mariachi bands in wide-brimmed hats and silver-studded charro outfits. She saw none of it. Ms. Park spent her nights in a hotel room and her days on the lanes at the Tapatio Bowling Alley. As she set pins flying, her older sister, Catherine, walked behind bleachers filled with cheering, screaming, chanting fans. In her arms she held her niece, Katelyn, delivered by C-section on July 27. After each game, win or lose, though it was mostly win, Ms. Park retreated from the lanes to join her sister amid the tumult. If needed, she fed her infant daughter, who is still breast feeding. Working mothers, here is your sporting hero. The juggling act will be familiar to many parents, who balance the demands of family with those of work. A further demand is made on her time by her desire to compete at a world-class level in a sport that in this country offers little financial reward. She won a silver medal last week while representing Canada at the Pan American Games in Mexico, her first tournament since giving birth this summer. Over the years, her achievements have been recounted in short newspaper articles. A junior title here, a Canadian championship there. Even when she was named Canada’s female junior bowler of the millennium back in 2000, the news barely received a mention in her hometown. The lack of profile does not bother her — “I’m not one to seek attention,” she said — though she wishes she could train every day. It is her burden to be a blue-ribbon champion in a blue-collar sport whose heyday passed well before her birth in Duncan on Vancouver Island in 1973. You might say her family lived in the gutter. Her parents, Bob and Annie Willis, owned Evergreen Lanes in Nanaimo. The parents had a rule for their three daughters: No playing on the lanes until old enough to attend kindergarten. At age four, she sulked as her older sister got to play. By age five, young Jennifer was playing ten pin. The three Willis sisters — Catherine, Jennifer and Kimberley — have all competed on the international stage. The trio has each bowled a perfect game — that’s 12 consecutive strikes, never missing a pin — at Evergreen. (The family sold the alley five years ago and it is now known as Splitsville.) Ms. Park has bowled a perfect 300 six times. A left-hander, Ms. Park’s skill has taken her as far afield to complete as Chile, Hong Kong, Japan, Argentina, Australia, United Arab Emirates, and the Dominican Republic. She qualified for the gold-medal match in Mexico, facing arch-rival Liz Johnson of Cheektowaga, N.Y., a professional bowler who was named the female bowler of the decade in a 2010 issue of U.S. Bowler magazine. Instead, she entered the finals exhausted by her schedule. Worse, she developed a blister on her thumb, as the callous had softened during her postpartum sabbatical. She even bled on her ball. The American beat her 232-196 and 235-190. Ms. Park returned home with a sore thumb and a silver medal on Friday night via Guadalajara to Phoenix to Vancouver to Nanaimo. On Monday night, she went trick-or-treating door-to-door with Jasmine, 5, dressed as a witch, and Brody, 3, a dragon. Her husband, Cameron Park, a vice-principal at Stu”ate Lelum Secondary, a independent school for First Nations students at Ladysmith, stayed home with Katelyn to hand out candies. 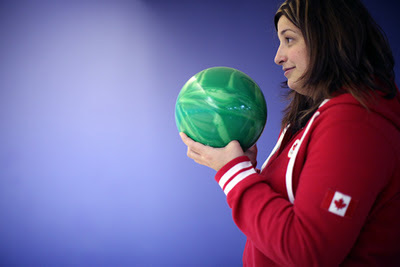 Ms. Park bowls with a 15-pound ball. Her infant daughter now weighs about 13 pounds. As it turns out, “carrying bowling balls is good practice for carrying babies,” she said. At the end of the month, mother and youngest daughter will once again board an airplane. Next stop: Johannesburg, South Africa, site of the 2011 World Cup, where she will compete against the top women from 70 countries. That’s just how this mother rolls. 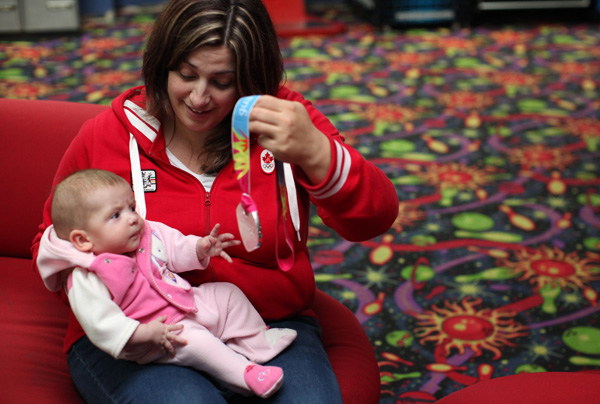 Baby Katelyn reaches for her mother's silver medal from the 10-pin competition at the Pan American Games in Mexico.